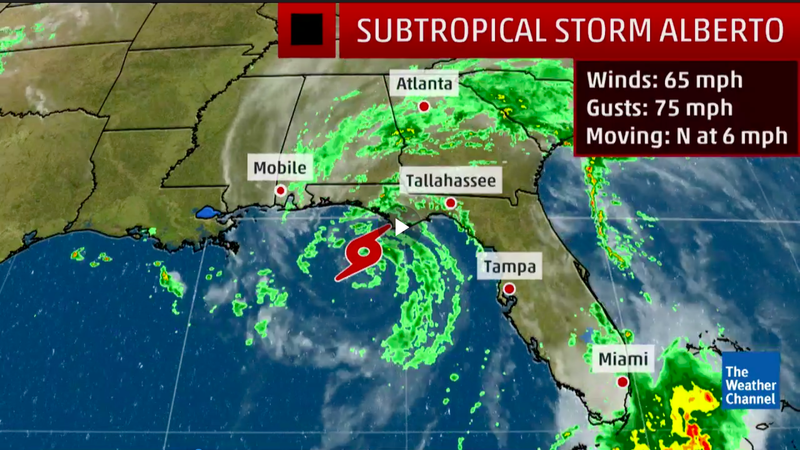 Subtropical Storm Alberto will make landfall on Monday in Florida's Panhandle with maximum sustained winds of 65 miles per hour, causing both Florida and Mississippi to declare states of emergency. The details: While subtropical storms are slightly different in structure to tropical storms, their impacts are similar, with the potential for flooding rains and damaging winds. Throughout the coming week, Alberto's rains will spread northward, into the Southeast and Mid-Atlantic, as well as the Midwest. Alberto formed a week before the official start of the 2018 Atlantic Ocean hurricane season, which is forecast to be a normal to slightly above normal season.